For other uses, see Brian Thompson (disambiguation). Brian Earl Thompson (born August 28, 1959) is an American actor. Thompson has worked in the action adventure and science fiction genres where his stature and unique appearance often lends him to imposing roles, although he has earned many comedic parts as well. His career began with a small role in the 1984 film The Terminator. His second feature was the hit comedy The Three Amigos. He played the villainous "Night Slasher" in the 1986 film Cobra. His first named role was on Werewolf, a horror series that ran during Fox's inaugural broadcasting year of 1987–1988. Thompson has played several characters in the Star Trek franchise, the Alien Bounty Hunter on The X-Files, and Eddie Fiori on Kindred: The Embraced. In 2014, he produced, wrote and starred in the B movie parody The Extendables. Thompson was born in Ellensburg, Washington, and raised in Longview. He attended Central Washington University, where he studied business management, played football, and appeared in many school productions. He then moved to California and received a Master of Fine Arts from the University of California, Irvine. He initially trained and pursued a career in musical theater, performing at Riverside Civil Light Opera's production of "The King and I", Long Beach Civic Light Opera's "Bittersweet", and several other musicals. In 1982, he was a resident actor at the Colorado Shakespeare Festival. Thompson's athletic build and unique facial structure were key in the initial roles he was offered. He has stated that it has occasionally been a double-edged sword when it comes to auditioning for roles, but it has provided him with consistent work. Thompson said, "If you're very physical in stature, you're gonna get hired for action movies. The star's always going to be chasing someone so they need an equal adversary. I'm never going to play a nebbish geek." Thompson was cast in The Terminator while still in school. He and Bill Paxton had minor roles as punk thugs. He followed that up with roles on Moonlighting, Otherworld, Street Hawk and Knight Rider before landing the role in the Sylvester Stallone vehicle, Cobra (1986). Although the film was critically panned, it was a commercial success. The New York Times wrote of Thompson's portrayal, "the archvillain, a character that is a cross between a James Bond fantasy villain such as Jaws and a raging psychopath, delivers a scorching monologue – a feat of linguistic sophistication that Cobra would have a hard time matching." In 1993, Thompson landed another comedic role on the large ensemble series Key West which was filmed on location in the Florida Keys. The series lasted for 13 episodes. He played a "new-age sheriff", which Thompson stated was the favorite role of his career. The character uttered the introductory line, "I'm Sheriff Cody Jeremiah Jefferson. I'm a direct descendant of Wyatt Earp and the Lone Ranger. My personal heroes are Ted Nugent, Buddha and Davy Crockett. I am the last real lawman and the first peace officer of the 21st century." The following year, Thompson began his tenure on The X-Files and followed that with roles in the science fiction-fantasy series Seven Days, Buffy the Vampire Slayer and Charmed. Between these, Thompson made dozens of appearances in other series and films. In 1996, he appeared in Dragonheart as the commander of the armies of David Thewlis' villainous king. The fantasy film, starring Dennis Quaid and Sean Connery, was a moderate success. Thompson then returned to the big screen as lead antagonist Shao Kahn in the film adaptation of Mortal Kombat: Annihilation. The film was both a critical and commercial failure, with a 3% approval rating at Rotten Tomatoes. The New York Times called it "colossal compendium of logic-defying martial arts, noisy, hyperactive special effects..." In 2014, Thompson released The Extendables, a film he produced, wrote, and starred in. A parody of movies like The Expendables, Thompson stated that it contained true-to-life instances from his own career. It was released via iTunes. In 1989, Thompson landed his first Star Trek role on Star Trek: The Next Generation. His size worked against him at first, because the producers were originally looking to cast someone who could fit in a certain costume. He was able to convince them to give him a try: "That was the first of five auditions that I've had for Star Trek and they've hired me every time." Thompson played a Klingon in the episode "A Matter of Honor". In 1993 and 1996, he appeared in episodes of Star Trek: Deep Space Nine as different characters. In 1994, he appeared in the feature film Star Trek Generations. In 2005, Thompson was cast as Admiral Valdore in three episodes of Star Trek: Enterprise. Thompson has since participated, to some extent, in Star Trek fandom, giving narrative DVD extras and appearing at conventions. Thompson is a stand up paddle surfing, windsurfing and kitesurfing enthusiast and studies hapkido. He has two children. 1984 Hardcastle and McCormick Police Officer Episode: "Ties My Father Sold Me"
1985 Knight Rider Kurt Episode: "Sky Knight"
1989 Star Trek: The Next Generation Klingon Officer Klag Episode: "A Matter of Honor"
1990 Alien Nation Peter Rabbit Episode: "Rebirth"
1993 Star Trek: Deep Space Nine Inglatu Episode: "Rules of Acquisition"
1995 Hercules: The Legendary Journeys Goth the Barbarian Episode: "Siege at Naxos"
1996 Star Trek: Deep Space Nine Toman'torax Episode: "To the Death"
1997 Buffy the Vampire Slayer Luke Episodes: "Welcome to the Hellmouth", "The Harvest"
1998 NYPD Blue Todd Episode: "Czech Bouncer"
1998 Buffy the Vampire Slayer The Judge Episodes: "Surprise", "Innocence"
2000 Charmed Horseman of War Episode: "Apocalypse, Not"
2002 Birds of Prey The Crawler Episode: "Split"
2003 Charmed Titan Cronos Episode: "Oh My Goddess (Part 1 & 2)"
2004 NCIS Master Chief Vince Nutter Episode: "The Truth is Out There"
2009 Chuck Cliff Arculin / Cliff Siljak Episode: "Chuck Versus the Suburbs"
2014 Hawaii Five-0 IA Detective Nicholas Cruz Episode: "Hana Lokomaika'i"
2017 The Orville Drogen Episode: "Into the Fold"
2018 9-1-1 Captain Vincent Gerrard Episode: "Hen Begins"
^ a b c d e Bolotin, Louise (June 10, 2012). "INTERVIEW: Action star Brian Thompson on The Terminator". Screen Jabber. Retrieved October 28, 2014. ^ Schneider, Michael (December 3, 2009). "Fox hunting werewolves". Variety. Retrieved October 28, 2014. ^ "Werewolf television series profile". IMDb. Retrieved October 28, 2014. ^ SFX Staff Writer (June 2, 2011). "SF's Serial Guest Stars". SFX.com. Retrieved October 28, 2014. ^ Man, Wild Peking (November 23, 2013). "Brian Thompson and Mark Dacascos are 'The Extendables'". City on Fire. Retrieved October 28, 2014. ^ WGA. "Brian Thompson". IMDb. Retrieved October 28, 2014. ^ "The Working Class - Brian Thompson". Cultural Atrocities. September 19, 2011. Archived from the original on October 29, 2014. Retrieved October 28, 2014. ^ a b c Eramo, Steve (March 15, 2011). "Sci-Fi Blast From The Past - Brian Thompson (Star Trek: The Next Generation)". SciFi TV & Talk. Retrieved October 28, 2014. ^ a b Nelson, Craig (October 5, 2012). "Manchester film fans turned out for a special screening of The Terminator and we interview Brian Thompson". Manchester Gossip. Retrieved October 28, 2014. ^ Darnton, Nina (May 24, 1986). "FILM: SYLVESTER STALLONE AS POLICEMAN, IN 'COBRA'". New York Times. Retrieved 28 October 2014. ^ a b Anderson, Phillip (July 22, 2000). "Interviews: Brian Thompson - actor, "X-Files"/"Star Trek"/"Key West"/"Dragonheart"". KAOS 2000. San Diego Comic Con International. Retrieved October 28, 2014. ^ Hiltbrand, David (January 18, 1993). "Picks and Pans Review: Key West". People Magazine. Retrieved October 28, 2014. ^ a b T'Bonz (March 31, 2014). "APRIL-MAY 2014 TREK CONVENTIONS AND APPEARANCES". Trek Today. Retrieved October 28, 2014. ^ Tucker, Ken (June 7, 1996). "Dragonheart (1996)". Entertainment Weekly (EW). Retrieved 28 October 2014. ^ Staff Writers. "MORTAL KOMBAT: ANNIHILATION (1997)". Rotten Tomatoes. Retrieved October 28, 2014. ^ VanGelder, Lawrence (November 22, 1997). "Mortal Kombat The Annihilation (1997) FILM REVIEW; Based on a Video Game. Need to Know More?". New York Times. Retrieved October 28, 2014. ^ Valkor (August 22, 2014). "The Extendables Movie Review". The Other View. Retrieved October 28, 2014. ^ Staff. "The Extendables". iTunes. Retrieved October 28, 2014. ^ a b Tenuto, John (December 17, 2012). "REVIEW: Star Trek: The Next Generation Season 2 on Blu-ray". Trek News.Com. Retrieved October 28, 2014. ^ Wedlan, Candace. "Hapkido Helps Put the Wind in His Sails". Los Angeles Times. Retrieved October 28, 2014. 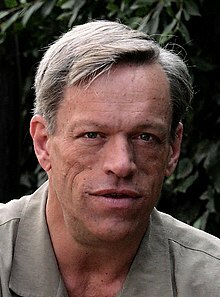 Wikimedia Commons has media related to Brian Thompson (actor). This page was last edited on 12 January 2019, at 11:37 (UTC).